WICT’s Strategic Touchstone Partners, a select group of leading organizations, show their commitment to diversity and inclusion by supporting WICT’s professional development programs, research projects and advocacy initiatives. This year’s partners include Charter Communications, Comcast NBCUniversal and the Walter Kaitz Foundation. Washington, DC – Women in Cable Telecommunications (WICT) today proudly announced its 2019 Touchstone Partners. WICT’s Catalyst Touchstone Partners serve as key champions of the organization and help WICT deliver on its mission of creating women leaders who transform our industry. These distinguished companies include Accenture, Altice USA, AMC Networks, ARRIS, Cox Communications, Disney and ESPN Media Networks, Google Cloud and Turner. WICT’s activities are also made possible through the support of this year’s Inspire Touchstone Partners, including A+E Networks, Cisco, Discovery, Inc., HBO and TV One. 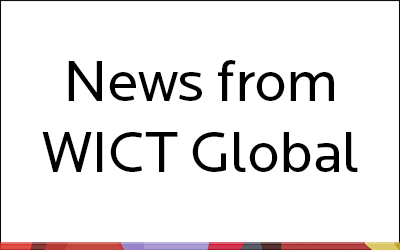 And as the industry continues to expand internationally, several global companies, including Discovery, Inc. and Liberty Global, offer their resources to support WICT’s international chapter endeavors. WICT’s mission is to create women leaders who transform our industry. We do this by providing unparalleled professional development programs, commissioning original gender research, and supporting a B2B network that helps advance women. For 40 years, WICT has partnered with cable and technology companies to help build a more robust pipeline of women leaders. Founded in 1979, and now over 10,500 members strong, WICT is the largest and oldest professional association serving women in cable media. Charter Communications and Comcast NBCUniversal are WICT’s Strategic Touchstone Partners. Please visit www.wict.org or follow @WICTHQ on Twitter for more information.